Summoner Wars is the exciting card game of fantastic battlefield combat that puts you in the grandiose role of a Summoner. With 16 different customizable factions, the strategies and tactics are endless! Want to learn how to play Summoner Wars? This video will teach you how! I had seen things here and there about Summoner Wars, but got the sense that the game was a two player luck fest that features limited strategic decisions. After all, you roll dice to fight and have to deal with card draws–why would I settle for something so shallow? But I kept seeing it come up as a recommendation in correlation to my deeper, strategic games. So I decided to just take the plunge and pick it up. I have been impressed and humbled ever since. Yes, there is some luck in Summoner Wars, but because you roll lots of dice over the course of the game (increased sampling size!) the luck tends to even out to a predictable norm. Still, there is room for moments of surprise, both good and bad, to keep you invested. The luck in the card draws is mitigated by the fact that one will likely use their entire deck over the course of the game. There’s no reshuffling, so you play what you get. The decks are all very balanced, leading to nice ebbs and flows where you might get a rush in drawing just the cards you needed, to be followed by dry spells as you go through periods of “meh” draws that you have to work around. Summoner Wars is surprising strategic, and presents the player with great choices turn after turn. Yes, you can rush and play the short game and try for an early win, but failing will leave you vulnerable for the rest of the battle. Invest too heavily in your infrastructure as you plan for the long game, and you may be caught before you could put it all together. Do I spend precious actions attacking my own men to prevent my opponent from gaining resources by killing them? Seriously, Summoner Wars is one risk/reward decision after another, with some variables thrown in to keep things interesting. I would be remiss had I failed to mention the factions. 16 different armies are available for play, each with a different theme and play style. Some are designed to surprise, others to overpower. Still others exert control and frustrate your opponent. What will you choose? I can’t praise Summoner Wars enough. Im my collection of 500+ games, I have found one that I can genuinely say I will be playing for the rest of my life–and enjoying every minute of it! 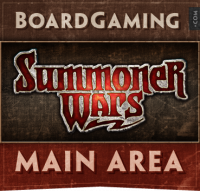 Summoner Wars is a card-based strategy game for two players (or up to four with an additional game board). Players draw cards and play spells/summon units from their hands like in other card based games, but the cards for summoned units are placed on a board and moved around the grid in much the same way as miniature figs. This grid-based unit movement and the fact that you are attempting to kill the opponent’s summoner to win have led many to compare the game to chess. This comparison gets you in the right ballpark, but the two games have little in common beyond these surface-level similarities. The first-time setup takes just a few minutes. There are some cardboard components to punch out and some shrinkwrap to tear off decks, but not many (six in the Master Set or two if you go for one of the starter sets). The rules take a few minutes to go through, but the basics of the game are pretty simple and the rulebook is generally clear, so it’s easy to get through all of this in 20 minutes or so. From that point (and in each subsequent game), it’s just a matter of looking at your deck’s initial setup card, finding and placing the starting units and walls, and shuffling the rest of the deck. After the initial unboxing, more time will generally be spent on players selecting which faction to use than the actual setup process. On the surface, the gameplay is very simple. Players choose a faction to play as, place units on their side of the board according to the initial setup card included in your deck, and then shuffle up what’s left. Players then roll a die with the winner taking the first turn. Turns normally have six phases: Draw, Summon, Play Events, Movement, Attack, and Build Magic. The first turn, however, skips straight to the movement phase where they can move up to two units (note that this is one less unit than on subsequent turns). Each unit can move up to two spaces, and diagonal moves are not allowed. Units can only move once per turn unless a card says otherwise. Once the movement phase is completed, the active player moves to the attack phase. There are two types of attacks. Some units are melee attackers while others are ranged. Melee units have to be adjacent to the unit they wish to attack (again, diagonal doesn’t count). Ranged units can attack as long as the target is within three straight-line spaces and there isn’t a wall or unit between the attacker and target. The player can attack with up to three units per turn, and each unit can only attack once per turn unless they have an ability that says they gain additional attacks. To resolve an attack, the player rolls a number of dice equal to the number printed on that unit’s card. Each die that is a three or higher counts as a hit, and each hit causes one wound. This luck-based combat may be off-putting to some players, but the luck-based components are somewhat offset by the skill-based movement of units and use of abilities. Back to the mechanics, now. Units die when their number of wounds is equal to their hit points. When units die, they are generally placed face-down in the opponent’s Magic pile (some card effects prevent this). Each card in the Magic pile counts as one Magic Point, which will be used to summon units. In addition to gaining MP through killing enemy units, the player can also take any number of cards from their hand and add them to the Magic pile during the Build Magic phase of their turn, which is the final phase of the turn. After the first turn players start by drawing up to their hand size of five cards. They can then choose to summon any number of units that they can pay for. To pay for units, the player takes cards off the top of their Magic pile and places them face up in the discard pile. Each unit has a printed summon cost, with more powerful units costing more MP. Units can only be placed on the board adjacent to a wall the player controls. If no spaces adjacent to a wall are open or if the player’s walls have all been destroyed, they can’t summon any units this turn. After the player has summoned any units they wish to, they have the chance to play Event cards. Event cards represent a variety of spells that the summoner can cast, ranging from buffs for units to dealing direct damage, to cheating units into play. Additional walls can be placed on the board during the Play Events phase. Playing a wall is free, as are Events, unless additional costs are listed on the card. From this point, the turn follows the same path as the first turn described above, with the exception of being able to move up to three units per turn instead of just two. Play continues like this until one player kills the other’s summoner. For most two-player games, this will take about 30 minutes. For four-player games, it can take an hour or so. The basics of the game take just a few minutes to learn. After a single game, most players should have a grasp of the phases of a turn and the actions they can take. Part of this is due to the general lack of interaction during your opponent’s turns. With rare exceptions, cards can’t be played on opponents’ turns or in response to opponents’ actions. This allows the game to be simple to teach, unlike more complicated systems like passing priority and the Stack in M:tG, while still allowing for complexity through the movement of the units and the different factions’ playstyles and unit abilities. This is where most of the learning curve will come in. Each faction plays significantly differently than any of the others. Given that there are a total of 16 factions available, this is quite a feat. They all feel well balanced, but learning how to utilize the abilities of one faction’s units in an effective strategy will take multiple playthroughs with that faction and playing against a variety of other factions. This is where my one complaint with the game comes in. The board is well-constructed and the wound markers are standard quality for cardboard components. The cards are made of good stock and are shiny enough to look nice but not so slick that they feel odd or don’t stack well. If you wish to sleeve the cards, they are a somewhat odd size that makes finding sleeves that fit somewhat difficult. The art on the unit cards is generally quite nice, but the event cards all simply have a closeup of the faction’s summoner’s face from his/her card on them. I know art can be expensive to commission, but even if the card’s art didn’t depict what it does (like on virtually every other fantasy-based card game), a bit of variety would have been nice. Sometimes the art that looked pretty good on the summoner card doesn’t look so great when blown up for the closeup. Also, there is virtually no difference between the art for a wall and a vine wall, two things that thematically are exceptionally different. These may seem like minor things, and they ultimately are, but they’re worth noting. The real problem, though, is with storage. None of the decks have any sort of box, and the insert that apparently used to come in the Master Set has been taken out in recent print runs. Plenty of game bags are included, and they’re better than nothing, but a better storage system would have been nice. I’m no stranger to having to print, cut, and glue tuckboxes, and plenty of tuckbox designs are on the internet, but it’s still something I wish the publisher would include for me. For me, more often than not, the time to actually play with gamers comes few and far between (alas), and finding the right game to get the family to play is hard, too. The games you play with the gamers tend to be more complex and strategic, and the games with family tend to be lighter, more gateway-type games. I’ve found this game bridges both camps, though tends to be more of a filler for the gamers. My only knock against the game is the components. The cards themselves—the heart of the game—are a bit cheap. I didn’t buy card protectors for Dominion, but it’s pretty much required for Summoner Wars. I’d recommend the “Premium Chimera” cards from Mayday Games (no, I’m not affiliated with them—just a happy customer of these particular protectors). Also, you’ll definitely want to get the optional board for the game—the folded paper playing board is worthless. Summoner Wars is a simple enough game to learn, but has a never-ending replay value and immense depth. I am a long-time HeroClix player who was looking to find a game with similar elements, but without all the rules headaches that have came recently. Many people have tried getting me into Magic: The Gathering, but I don’t want to spend tons of money to play a competitive game. Summoner Wars, too me, is the best parts of those games without all of the negatives. The Faction decks, when bought, are ready to play and are already competitive. Sure, you can go buy more Factions, Second Summoner and Reinforcement decks to build the best, but you don’t have to. This game can stay as simple or be as diverse as you want it to be. Summoner Wars is truly a great game that offers a new story each time you play. I have lost about 80% of the games I have played, main person I play against is a great strategist, but still cant get enough. Lots of playability due to the numerous factions and extras you can buy for each faction. Mix and match, customize or just play with the base decks. I myself have had a lot of fun learning the quirks of each faction and “fixing” the inherit flaws with reinforcements available. If you like strategy and want a quick fix this is the game for you. Summoner wars doesn’t take long to play through a game but yet satisfies a lust for strategy and has enough customization to make it your own without giving a “pay to win” feel like some CCGs. Card-based miniature-style combat sounded kind of neat. The card art looked to be very well done, from what I had seen. The gaming podcasts and website reviews seemed to have been favorable, overall. At the time, I was fully entrenched in painting two armies for Games Workshop’s Warhammer 40,000 miniature game to get myself into another strategy battle game. After those Space Marines had gone off to pasture, I finally had some time to really find out more about Summoner Wars. The fantasy theme was quite appealing and the style of card play, mixed with a tactical table-top game, drew me right in. The game play mechanics are simple and easy to learn. The armies are different enough to make each play quite differently. I love this game, even after many plays. I have picked up all of the expansion packs and own both starter sets. This game is relatively inexpensive to get into and offers a deeply strategic game out of the box. I would recommend this game to anyone who has had even a mild interest in it. You can certainly use it as a filler game, between longer games, or play several games in a row and have a great time, either way. Don’t wait for the Master Set that releases this summer, as it contains none of the originally released armies. Grab a starter now and get playing! The first time I played Summoner Wars was on an empty Saturday and my shiny new master set had arrived in the mail just the day before. (At least it was mostly my master set, my friend and I split it). My good gaming buddy arrived early just as excited as I was to learn a game we had heard nothing but good things about. It truly didn’t disappoint. We rapidly, and carefully, cut the plastic wrapped around 6 decks of beautiful cards. After each one was open we looked at each deck, not knowing what any text or numbers meant, and stared at all the pretty pictures on the cards. After we had finished gawking at the pretty game components we opened the rulebook. Not 15 minutes later we were taking the first turns of a game that would then become number 1 on my top 5 board games in the universe. Summoner Wars is a game of tactical combat and strategy developed by Plaid Hat Games. You play as a summoner who uses magic to call troops to his aid. In a very chess-like fashion, the object of the game is to be the last player with a summoner on the battlefield. The summoner, like a king in chess, is the most important card and you must protect him while trying to destroy your opponent’s. Summoner Wars is most definitely my personal favorite game right now. For such an easy-to-learn combat game I was amazed how many strategies there were at my disposal. Most combat games, in my experience, have big thick rule guides having to mass out all the possible combat situations. (The thickness of the rule book is what turns a lot of people off the board games). In Summoner Wars, 8 paragraphs are spent on combat and movement total. And that includes the how to use combat special abilities portion of the rules. Even with all this simplicity and logical format, there is an amazing amount of ways to play. To drive the point home; this is the simplest strategy game to learn, and the most complex set game play ideas to make every second of play interesting. On top of that, this game is just plain fun. There are games which “work” and yes they are “games” but they just aren’t fun to play. Summoner Wars really brings out the best in how to make a game playable, fun, intense, and exciting all at the same time. With a fluid and easy to understand game play system it’s easy to make tactical mistakes that can be your undoing. An advanced game of Summoner Wars takes an uncanny amount of fore-thought, prediction, and vigorous attention to your own weaknesses (because they are always there). Though on the other side, this is a game that it can be the game that you are able to convince people to play because it only requires a simple understanding of the cards to play. While I love thinking and being able to win, I love even more having fun with my friends and getting excited about random happenings of luck (or misfortune). The twists and turns of Summoner Wars allows for just that. Very few instances will you be able to predict how the entire game might shift in the matter of one turn. The only weakness of Summoner Wars is the fairly small amount of customization of the game there is. To clarify, each deck comes preset exactly the same, you can then buy the reinforcement pack for it and start editing the deck to your own style but even then there are a good amount of limitations. Most of the time you can only have cards in your deck from one of the 15 factions. The exceptions to this are the mercenaries whom may be in any deck and there are also some people who do away with the faction limit rules and use a free build style. Either way, the Summoner Wars system is fairly new and has somewhat limiting product so far, especially if you like to play 1 deck most of the time. Myself, I prefer to use a different faction every time I play so of course that expands the variety with which to play. But, this is mainly because of the fact that Summoner Wars has just been published in 2009 and is still expanding. From what I have heard there will be secondary summoners being released at some point which will at least double the amount of variety within each faction. To sum everything up, Summoner Wars is hands down a fantastic game that has yet to grow to it’s full potential. I have had loads of fun with this game. Easy set-up, easy learn, easy play, complex strategies, a GRAND old time! I recommend this game to any pro, avid, and casual gamer that looks for the most in every game. I have certainly been impressed by Plaid Hat and I expect great things from their upcoming additions and games. Summoner Wars if most definitely a game that everyone should try at least once and get a feel for a really incredible game designed by geniuses. Not really one of my favorite games and that is just a personal preference. Many people love this game and its easy to see why. If you enjoy chess and or any type of wargame that is tactical with troop deployment and movement you will probably enjoy this. 2 players pit off on a board like chess. Each player chooses a race/group of characters to help them defeat their opponent. Each race starts off with some of their characters in different spaces on the board and each have different amounts of movement, range, attacks, hit points, an so forth. In order to cast any of your characters that weren’t already present on the board when you started you have use discarded cards. These discarded cards then become unusable for the rest of the game! so you really have to plan out when you want to buy guys and which ones you want buy. The game changer comes when you kill another persons character you then gain their card and you can use that as a card that is discarded to pay for new character cards. Like I said the game is not one of my favs, but that doesn’t mean its not a good game. There are a lot of good concepts and it is a very popular game so finding others to play shouldn’t be to hard. game with excellent mechanics, arrived not long ago and is already successful, and has in Portuguese, the sale can be found in the Galapagos. Already has several expansions, the game is a chess monster, so I like to think. It is intuitive and each deck plays differently, not counting q decks are well balanced thus you’ll end up not trying to overpower a closed deck. This game is amazing. It is as easy or complex as you want to make it. The more I play, the deeper the stratigies go. My only wish was I had more people to play this game with. This is one of those games that “ain’t over till it’s over”. Even when you are sure you have won (or lost), the next hand can easily tip the scales the other way. Plus there is a limited number of cards so you don’t need to buy endless expansion packs like a lot of card games. Plaid Hat Games is a great company in my opnion. Simple, easy game to teach and play, with an awesome amount of replayability. This one comes out on every casual game day. After more than a 100 games played and owning almost everything there exists for this game I love and crave to play it still! Definitely a gem which will forever be in my collection! I have searched long for a great portable 2 player game which I can play with my gf on vacations. With Summoner wars we have definitely found it!! Replay-ability is amazing already with 2 decks but with so many it is just unheard of. Even after sooo many games every game is still tense, unique and great fun!! Note that in 2v2 mode game is much different. I also love it because of new synergies and cooperation but it is much longer and I definitely do not recommend this mode with/for new players! 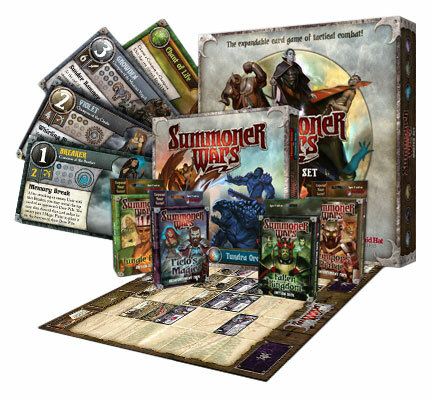 Add a Review for "Summoner Wars"